Tcp Port Redirector is a useful tool to redirect TCP traffic from one port on the same or another machine to another. This tool is used for testing some services, firewall and intrusion detection systems. This tool can also be used for debugging programs and configuring other network tools. Depending on Client/Server mode the tool works as a Tcp client or server . The field Interface contains local IP address (n case of server mode ) , Dest Addr contains the server address you want to connect ( in case of client mode ), Port is a local port(for client mode this is a port to which the client is binded, for server mode this is a port to which the server is binded ). If the connection is established you can see the active connection parameters in Active Connections table. To close the connected client ( in case of server mode ) select the appropriate client from the Peers list and click on the Close Client button. 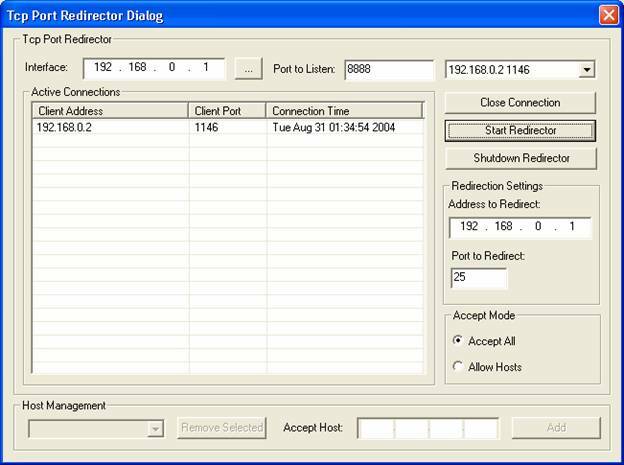 The part Redirection Settings contains Ip address ( Address to Redirect ) and port ( Port to Redirect ) to redirect the TCP traffic. Tcp Port Redirector supports two modes of accepting hosts. Accept All - accepts connections from all hosts. Allow Hosts - accepts the connection from a specific host. To add a host to the accepted hosts list enter the host Ip address in Accept Host and click on the Add button.